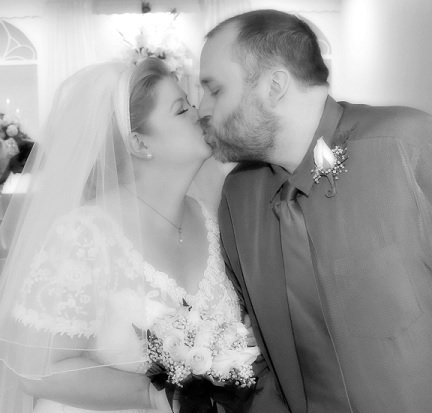 Marrying my husband is one of the smartest things I’ve ever done. We went out on our first date on January 24, 2002. Valentine’s Day came up quickly–I think it was our 4th date, in fact. I know our 3rd date was a Super Bowl party at Leslieann’s house. For the big date night, B took me to a little hibachi restaurant, with a detour to a bookstore when we ended up having to wait longer than we’d anticipated. Hours later, we got back to the car, and he went to start it. It only took a few seconds of fumbling for him to figure out that when he had turned on the dome light to read my V-day present to him, he hadn’t turned it off. The battery was dead. We called AAA, who told us it would be about an hour before they could get to us, so we went for a walk around the square. It was chilly, and I asked B if he needed his jacket. He said no, and threw it in the backseat, locked the doors, and off we went. Halfway around the square, he went to get something out of his jacket pocket, only to realize he wasn’t wearing it–that something? His car keys. We walked back to where the car was parked, still waiting on AAA, and updated them to let them know that a) the battery was dead, and b) we had locked the keys in the car. They said that was fine, and they’d be there soon. So, we wandered into the bar at the corner of the strip, where B excused himself. He came back a few minutes later, red-faced and defeated. As we watched a man fall from a barstool, flat-backed onto the concrete floor (and get up, and repeat his drunken feat), B explained that he had walked into the ladies’ restroom. The occupied ladies room. It wasn’t a great night for him. As dates go, it was a technical mess. As romance goes, it was a perfect 10. B never once lost his cool. He never got angry. He never showed frustration. He didn’t blame me, or throw a fit, or behave badly toward anyone out of anger at himself. He was just exactly the same guy he had always been, only embarrassed. I’d already decided I was going to marry him, but it was our first Valentine’s Day date that really showed me his character under pressure. He is a kind, good-tempered man, and I feel very lucky that I was able to trick him into proposing to me. I really wish we could have seen you!